Finally…a program that shows you exactly how to find fulfilling career alternatives for JDs and cracks the code for communicating with employers so your JD works for you. Despite how you might feel right now, your background as a JD is transferable and in demand. That’s why you’ll find happy JDs working in such a wide variety of careers — with no regrets for leaving the traditional practice of law. You too can be doing work you find fulfilling. The key is to first determine what fits you and your qualifications. Then it’s all about cutting through the clutter to get through to employers, and getting them to take you and your background seriously. 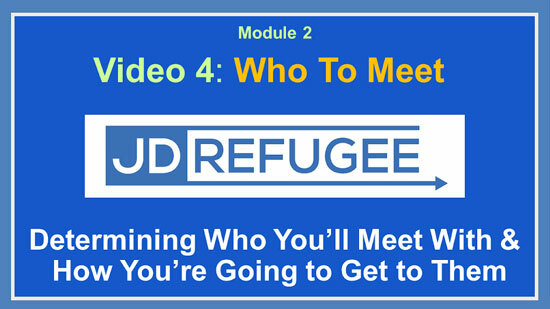 Helping you with all of the above is why I created the JD Refugee® class: a practical, step-by-step video guide to the transition that will spare you the time and frustration of going it alone. Below, I’ll share how it can benefit you. 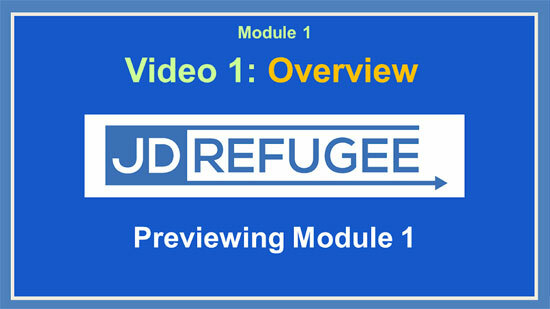 JD Refugee® class for you. I went to law school with the goal of practicing entertainment law. I’m a graduate of the University of Michigan and the Chicago-Kent College of Law, and a member of the Illinois Bar. A summer associate job in a record company’s legal department in NYC led me to conclude that practicing law wasn’t for me. So I made the tough decision to take my skills, talents and interests in a new direction. First, I spent several years in the music industry in Los Angeles (doing licensing and more). When that industry melted down, lots of soul searching, career counselor meetings and networking led me to become a legal recruiter. I’ve been helping lawyers with their careers since 2003. Today, as the founder of JD Careers Out There (JDCOT), I’ve guided lawyers of all stripes over career hurdles and produced the first-of-its-kind, award-winning video interview series featuring JDs working in a wide variety of careers. My life and theirs prove that you’re not alone in wanting to use your JD in fulfilling ways – and it’s possible to do that whether you start right after school or after years of practicing law. 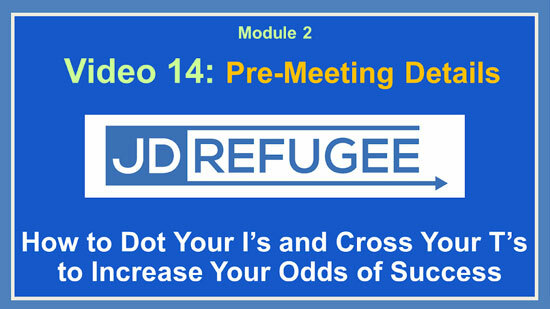 The JD Refugee® class is inspired by my years as a legal recruiter, where I talked to countless lawyers who were unhappy and wished they were doing something else. I had experienced their pain of realizing that law wasn’t the right fit. The feeling of not wanting to walk away from something you worked so hard to earn. Not wanting to “take a step down.” The frustration of employers being scared away by the JD. I wanted to help this smart community break through these roadblocks, discover their ideal fit and help them get it. 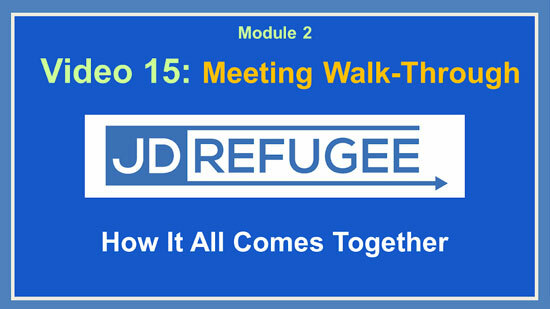 Like your favorite study guides, the JD Refugee® class is designed to save you time and frustration. I’ve combined the wisdom of my JDCOT interview guests with my own life experience of going through career changes and breaking into alternative careers for lawyers. I’ve seen what works and what doesn’t – and I’ve boiled it all down for you to this blueprint for success. Whether you’re from a top school and firm, an unranked school and solo practice or anything in between, I look forward to helping you. Life is too short to be stuck in a career that doesn’t fit. The longer you stay put, the more you suffer needlessly – and the tighter your golden handcuffs will get. I’m here to help you. So let’s get started! 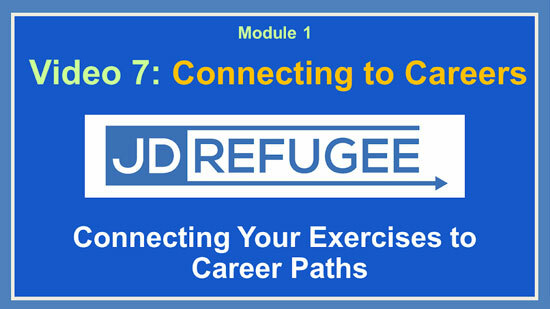 This class changed the way I talk about my professional experience, legal background, and career goals. That more focused, composed communications ability impressed both friends & employers. Following this class, I was more confident in myself and in what I wanted. This clarity was invaluable! It led me to find the right job and be able to communicate why it was right. 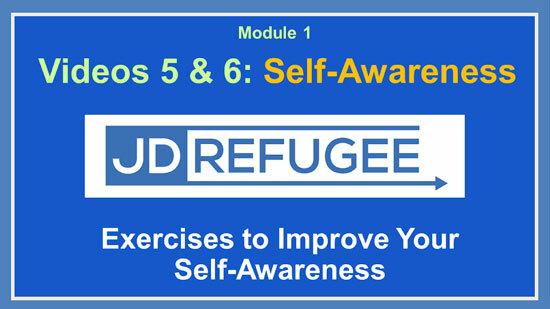 I wholeheartedly recommend the JD Refugee course. The course helped me to diagnose my strengths, look at job paths that would use those strengths, and reframe my law school training. 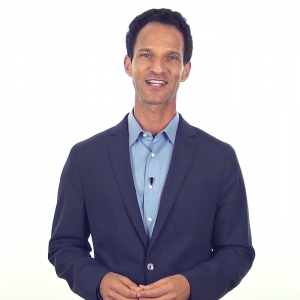 Marc is one of the most enthusiastic teachers I’ve seen, with a clear passion for helping us discover that our law training can be an asset rather than a liability. 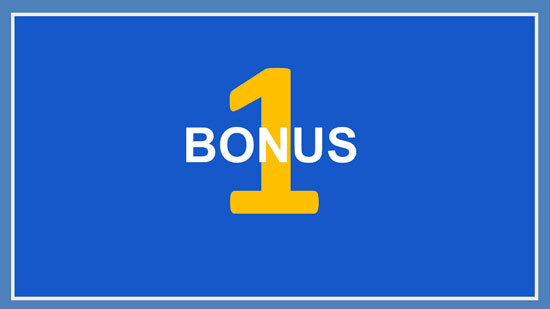 Special Bonuses When You Sign Up! 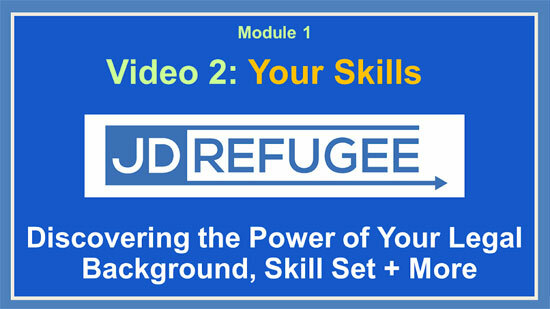 Discover and explore a wide variety of alternative careers for JDs via the library of video interviews I’ve conducted. Watch and learn from real-life examples of JDs who have left law for a broad range of career paths. They share everything you’d want to know about their work – from a typical day to how their JD helps to how to break in to their field. Get advice from diverse voices on topics like interviewing, networking and more. Support, feedback, networking, etc. Get your questions answered and get feedback from a community of JDs going through the same life experience. I’ll check in each weekday to be there for you, interact, answer your questions and provide a sense of accountability to keep you moving forward. Advice, guidance and group discussion by phone during my biweekly evening office hours. Call in to discuss class exercises, get feedback from me and fellow classmates, and get advice to help you reach your goals. My mission is to help you get to where you want to be: a happier, more fulfilling, less stressful place. “I would absolutely recommend this course to anyone who is looking to explore new careers in a streamlined, well-presented way, as well as anyone looking to have a deeper understanding of themselves and their skill sets that existed before and were shaped by law school. The benefits of taking this class, both in the short and long term, have been unique to any other class I’ve taken, either in or out of law school. After practicing law for about four years, I began to get the overwhelming feeling of “is this all there is?” I increasingly found that I wasn’t satisfied in my field. Each time I contemplated branching out and leaving law, I became frustrated and was unable to articulate why I wanted to leave or how my legal background would be applicable in a new field. After beginning this class, it became apparent that Marc’s methodology was unlike anything I’d come across. For starters, the class allowed us to focus on the sometimes uncomfortable realities of why we entered law, what we struggle with, and what our desired future careers would include. A variety of introspective exercises provided me with clarity about my abilities and how they would translate outside a legal setting. Marc also employs different styles of learning tools to get you more comfortable communicating with other people about yourself and your goals. 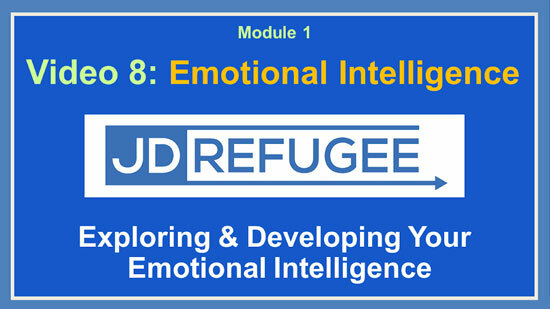 “I would absolutely recommend taking this class with Marc. This JDCOT class has really given me the tools to start moving towards a career outside the legal field. I was skeptical of this program at first because I didn’t know what to expect and because I didn’t know Marc. However, having gone through the class, it is extremely apparent that Marc has put together a well-thought-out program that really helps guide you through the process of finding out what alternative careers might be a good fit for you. The exercises and videos that are a part of this program logically help you self-reflect on your interests and strengths, which Marc understands are vital in finding a fulfilling career path. If you are looking for job placement, this program will not do that. What Module 1 of this class will do and has done for me, is teach you to identify the right tools for you to develop your exit plan. 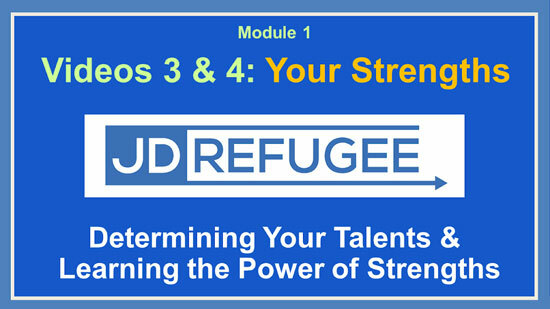 Although I found some of the exercises challenging, this program will benefit you in the long run because being able to identify your key motivators and strengths will not only help you now, but will help you down the road if you ever find yourself looking to switch careers again.” - Reina T.
“Participating in Marc’s Leaving the Law course was a great investment that I would highly recommend for any attorney contemplating leaving the legal profession. Ultimately, leaving the law is a tough decision that requires great self-reflection that should not be performed hastily. Marc’s course does a fantastic job in aiding the students to take a critical step-by-step approach to help them better decide whether leaving the law is truly the right choice and, if so, how their natural talents can be better utilized in a career outside of the law. It’s risk-free with our 30-day guarantee! 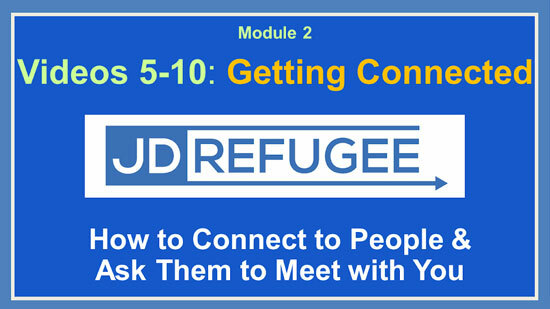 The JD Refugee® program comes with a 30-day* money back guarantee. You have nothing to lose. 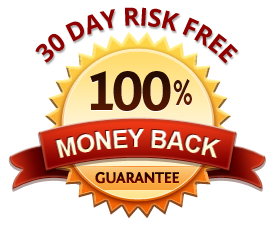 If you are unhappy with this program and conclude that it can’t help you, email me within the first 30 days of your registration date and I will refund your investment. I pride myself on high-quality programs that actually work…if you put the work in. I stand behind the JD Refugee® program 100%. Do you have any questions? Please email me your questions and I’ll get right back to you. What, specifically, will I have when I finish this class that I don't have today? You’ll know what kind of work you’re looking for, what you can contribute to that type of work, why it fits you, and how to articulate all of that so that your background works for you rather than against you. 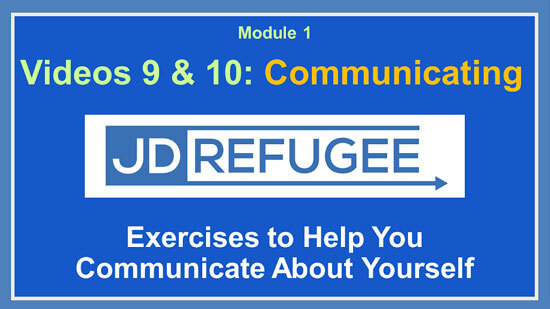 You’ll be presented with scripts for a wide variety of scenarios to help you communicate effectively. You’ll get tools to greatly boost the efficiency of your exploration-transition process. You’ll walk away with a step-by-step action plan for growing your network, meeting with people, getting their support, avoiding the resume black hole, accessing the hidden job market, and breaking into the path you want. Early adopters of the class have said these things provided them greater clarity, confidence, and an ability to approach the career change process in a way that feels more positive and exciting than fearful. How can I be sure to achieve progress? You’ll receive access to video lessons, PDF exercises, digital tools, our private online community (with access to me & your fellow JDs in the program), and biweekly office hours calls (where I’ll be with you every step of the way). The video lessons and website will always guide you to your next steps. 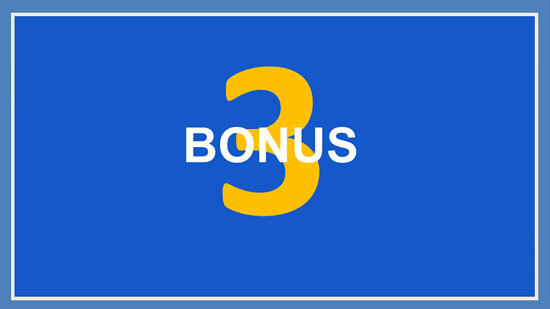 You will have the freedom to watch the videos and do the exercises on your own time. There is a recommended pace based on the experience of previous students. It is designed to keep you moving forward while also taking your busy lifestyle into account and providing you time to digest the material so you can maximize what you get out of the program. The system will unlock class content based on that recommended schedule. You can always move slower if you choose. 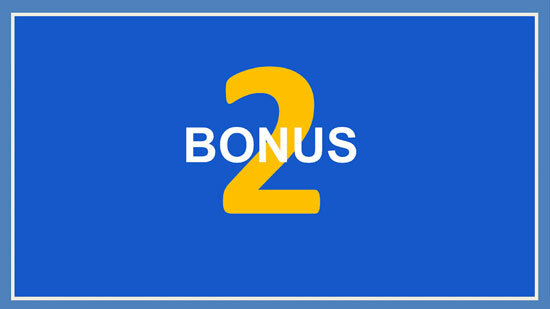 If you wish to move faster, content can be unlocked for you by request when you are paid in full. Upon enrolling, you’ll get instant access to the class. You will have the freedom to watch the videos and do the exercises on your own time. Most of the videos average around 30 minutes in length and have exercises associated with them. How long the exercises take will vary from person to person but a time estimate will be provided. Section 1 has 10 videos and Section 2 has 16 videos (but less exercises). There is a recommended pace based on the experience of previous students. It is designed to keep you moving forward while also taking your busy lifestyle into account and providing you time to digest the material so you can maximize what you get out of the program. You can always move slower if you choose. If you wish to move faster (not common but perhaps you have extra time on your hands), content can be unlocked for you by request when you are paid in full. You will have access to the program for 6 months. 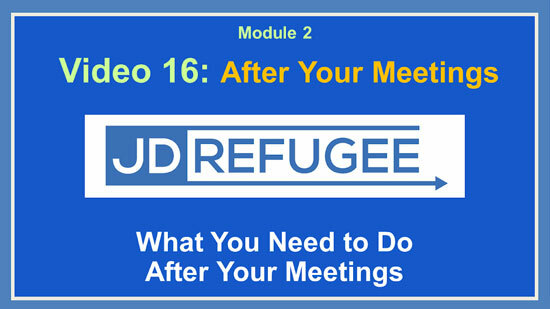 This provides you more than enough time to complete the videos and exercises plus have leftover time to keep calling in to the group calls as you take action and implement what you’ve learned from the program. I will host an open Q&A call every other week to answer your questions about the videos and exercises, provide guidance, and open the floor to group discussion. Call dates & times may vary, but will most often be on Tuesday evenings at an 8:30 pm Eastern/5:30 Pacific start time. Oh no! We don’t want that! If you conclude that this class can’t help you, email me within the first 30 days of your registration date and I will refund your investment. What does the course look like when I'm logged in? This program will help you too. That doesn’t mean ageism doesn’t exist in the workplace – it can. But you can only control what you can control – and that’s the part I’ll help you with. What if I’m not licensed yet? You’ll have a different story to tell employers than someone who has experience, but the content of the class applies to you and will help you too. What if I’m financially strapped? I don’t want to take money from anyone who doesn’t have it. If you’re overburdened by student loans and in dire financial straits, please get back on solid ground and then revisit this. In the meantime, you may benefit by watching the free video content available on JDCOT. What if I am not in the U.S.? 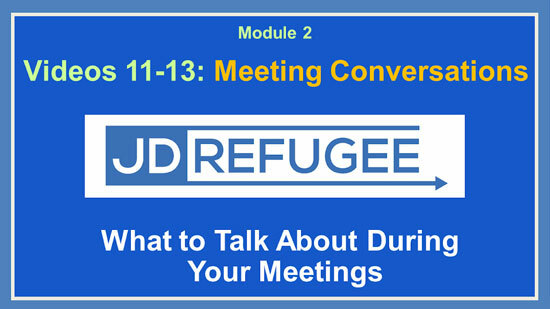 The content of this class is pretty universal and should apply regardless of country. If there are cultural differences, you will recognize them and know how to compensate.